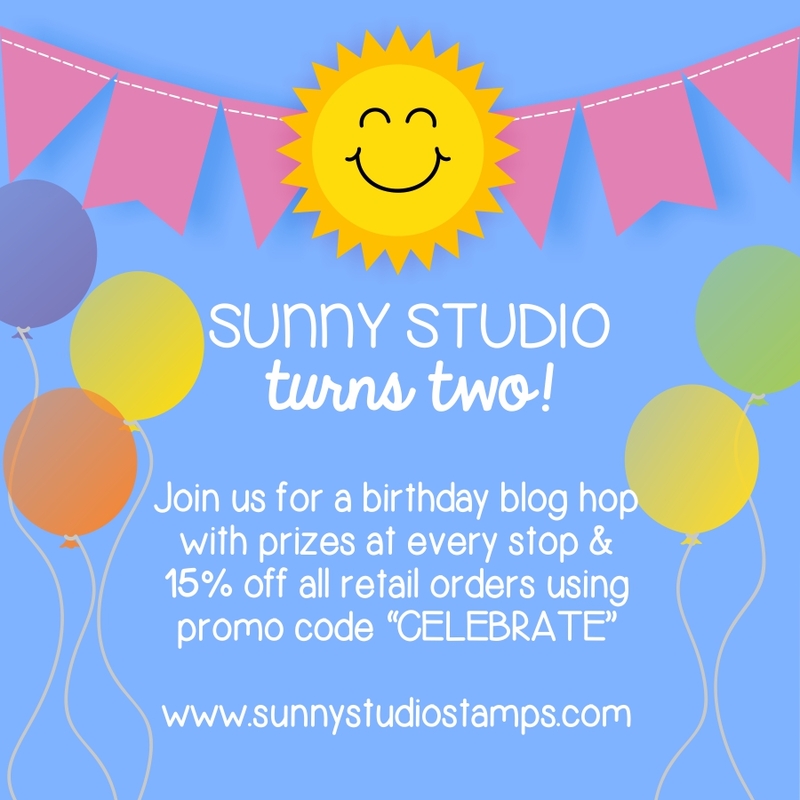 Hi everyone, Eloise here and today I'm here participating with a ton of other designs for the Sunny Studio Stamps 2nd Birthday Blog Hop! I'm so honoured to have been on this team for the past year and a half and so thankful to Mendi for having me on this amazing team. I love working with you, the team and your stamps! Before we get into the card I made, here are some details on the hop. I will be having a $25 gift certificate as well as every other designer on this blog hop, so make sure you don't miss any stops and you leave a comment on everyones blogs! (To be entered, tell me what your favourite stamp/die set is from the release!) I will be picking a winner before Monday the 25th at 11:59 pm PDT and then Mendi will reveal the winners on the Sunny Studio Stamps blog on Friday the 29th. Also in honour of Sunny Studio's 2nd birthday, all the products from this release will be available for pre-order as of right now. And also, if that's not enough - we will be offering 15% off on all retail orders in the shop using the code "CELEBRATE" through October 1st. Yay! Now, here is the list of blog hop participants. Now - onto my card! 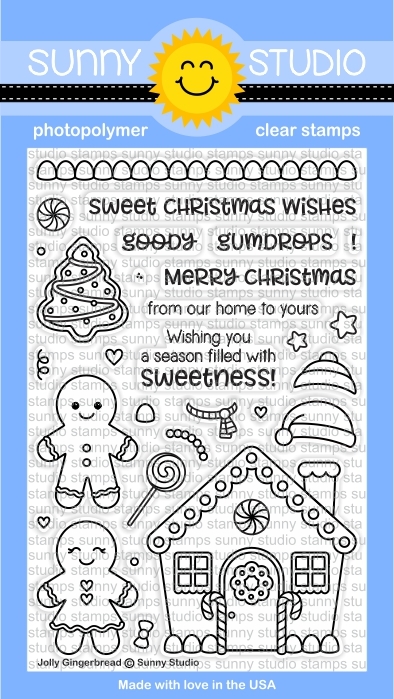 I used the Jolly Gingerbread stamp set to create a scene card. Isn't this stamp set just the cutest?! I stamped the images from the Jolly Gingerbread stamp set onto some watercolour cardstock and watercoloured all my images in with Zig Clean Color Watercolour Markers. I then used the coordinating dies to cut them out. I used some 2" masking tape and cut it at a curve, adhered it down to some watercolour cardstock and blended some tumbled glass and broken china over top for the sky. I then removed the positive mask, and added on the negative piece. I then blended some pumice stone distress ink on the bottom, just so it wasn't a stark white. Once I finished the background I stamped the sentiment with some more black ink from the Jolly Gingerbread set and then adhered my images on top with foam tape and liquid glue. To finish up I adhered my panel onto some Perfectly Plaid Christmas patterned paper from Lawn Fawn and then onto my card base and that finished up my card. Thanks so much for stopping by today, the next person on the stop is the amazing Nancy Damiano, make sure you stop by and follow along and leave comments to entered to win the gift certificates! Love the gingerbread cuties! This is a very sweet set! Very cute card. Love the new release! What a merry little scene with the gingerbread folks. So sweet!! This is just the "sweetest" card! Thanks for sharing your talent with us! I love the gingerbread house! Thanks for the video. You make water coloring look so easy. 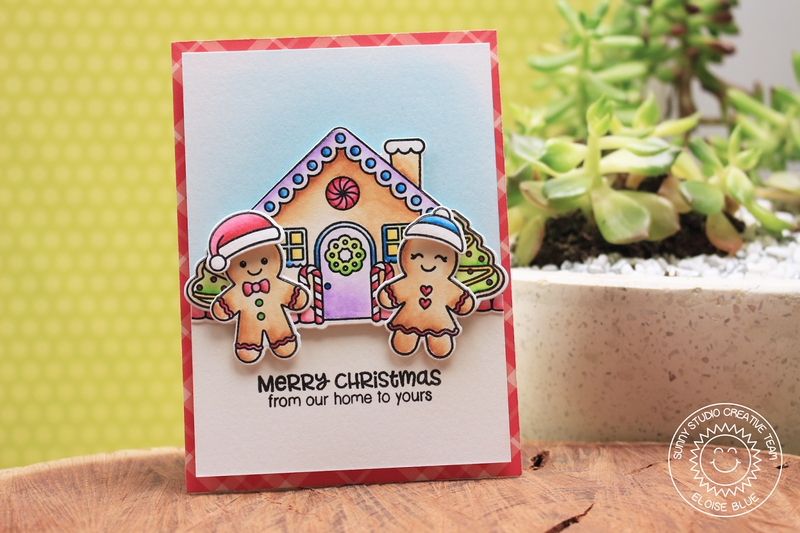 Oh I LOVE gingerbread people and they are illustrated so adorably in this new set! I love your pretty, soft coloring and layout! These are adorable and such pretty coloring! Love your adorable card and great video! Thank you Eloise! Super cure card. Love the Gingerbread boy and girl, fabulous coloring! The little gingerbread people are really adorable! Love your pretty shading and color! Thanks for sharing! Aww. This card is SO cute. Oh my so adorable! This release is amazing! Gingerbread - fond of the tea - got so addicted one year -and bought tons of boxes of it - love your gingerbread people and layout - thanks for sharing and for the hop - Happy Birthday!! Sunny Studio rocks!!!! Happy Birthday!!! What a sweet card. Gingerbread really puts me in the mood for the holidays! Adorable scene card Ella! The gingerbreads look so sweet! Can't say enough Happy Birthday to Sunny Studios, many more.... these two gingerbread cuties are wonderful. This is the sweetest set. Nicely done. Thanks for sharing. You did an awesome job on the coloring of these cards! Love this stamp set!! Awesome and totally adorable scene! I love gingerbread houses and kids! This is sooo cute!! This is so cute great coloring! This card is so sweet! love the gingerbread scene. Thanks for the video. Gingerbread cookie kids are so fun, and your card is adorable. This set, and your card, are so cute! So cute! Love me some gingerbread men/women! Super cute gingerbread scene! Love it! Great card, beautiful coloring, thanks for the video, I need all the help I can get! Oh how I love this cute little gingerbread scene! Adorable! Lovely card! These cute ginger bread men are so adorable! Cute holiday scene. Who doesn't love gingerbread boys and girls. Such a cute card. Your blog is new to me. I will definitely follow. Thanks for the great video. Precious kitty. So adorable and sweet! Beautifully done! Thank you for your inspiration and giveaway! Very cute card! I like this stamp set. Love this gingerbread set. Definitely goes on my wish list. Beautiful card, wish I could get my Zigs to look like that! This is a really great set and your card is so cute. Adorable gingerbread figures and house. Lovely coloring too. Thank you for sharing. Such a sweet gingerbread man and woman. Love your cute card! Thanks so much for the video tutorial to show me all the steps necessary to do for such a great looking card using the Jolly Gingerbread. Such a cute card, loved the video. Little Gingerbread people are so cute. 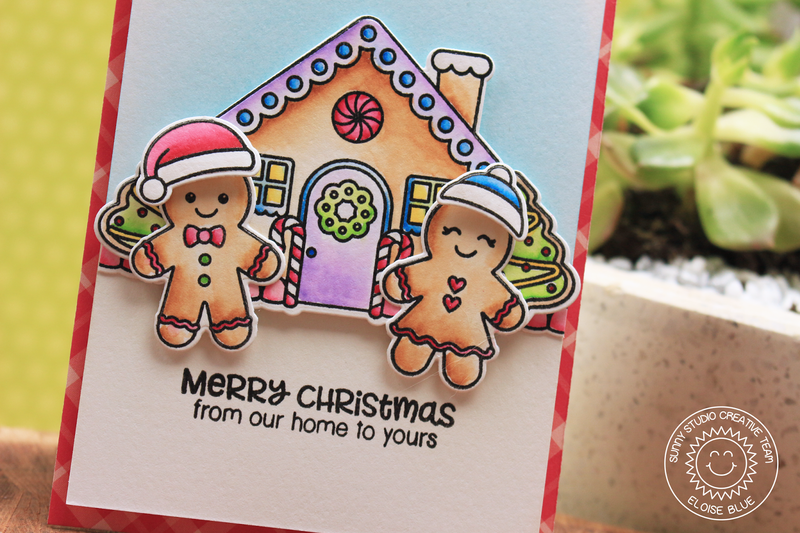 Awww these gingerbread friends and stamps are so so cute! This is super sweet!!!! Love your little scene and how lovely you watercolored it all! Adorable card! Great coloring! Who doesnt love a gingerbread house? Congrats Sunny Studios! Your products are fantastic! What a cute card. I love the gingerbread house and the gingerbread couple. Love this darling card from Eloise! I always enjoy her videos and so glad she is helping Sunny Studio celebrate their new release and their birthday!!! I love this set and your card. You can almost smell them. Love your very cute gingerbread card....looks almost good enough to eat. ;) AND happy birthday Sunny Studios. This Gingerbread card is so cute. I love the colors and how you colored your card. Thank you for sharing. Such an adorable card. The coloring is wonderful. My nephew loves making a gingerbread house, with his Mom, each year. I give him a kit each year on Thanksgiving. This new set would be perfect to create a card to go with it! This card is adorable! The gingerbread people are lots of fun. 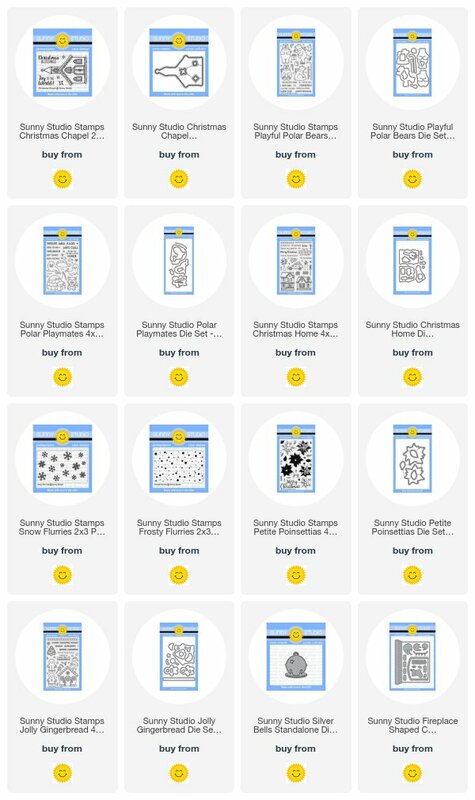 I think the poinsettia stamp/die set is going to be my favorite, but I'm definitely going to have a hard time trying to decide what to purchase! Very cute. I like your coloring. My fave from the release is the Christmas Chapel. This gingerbread set is darling! love your coloring. I'm truly lovin this company. Last years jingle bell is one of my all time favorites. Glad to see the die coming out! Love this fun gingerbread set! Adorable card! Oh my gosh, they are sooooo cute! What a sweet card Eloise. Well done. Just love your sweet card. Totally sweet. Love these stamps too. Adorable. Love those gingerbread men! This card is so sweet it makes my teeth hurt! The gingerbread men make such a cute card! The gingerbread men are so cute! What a cute card!!! And Tiger totally stole the show by the way!!! His little bowtie is adorable!!! You did a great job on this card!! Super sweet card, Eloise! Beautiful watercolouring! Happy BD, Sunny Studios. My favorite is the Christmas chapel. I don't have anything like it in my supplies, and I love it! (Also the Christmas Home and the gingerbread images...really, who can pick ONE?! I can totally see customizing the fireplace set, too, for those special people in my life. ) Thanks so much for this very fun card. These kind of images really draw me in. See what happens when you start typing before you finish watching the video! Totally cracking up about the cat! I will probably still be smiling at bedtime tonight, so thanks for leaving it in. The card you made is so cute. Polar playmates is my favorite set from this release. Another gorgeous card. Love the colouring and "sweet" gingerbread house! That's an adorable card very well executed ! My favorite products of this release would be the Polar Bear equally with this gingerbread house. Such a cute card! I love the little Gingerbread people. So cute! this is so cheerful and fun! What wonderful coloring!! Adorable gingerbread house. Love the coloring! Such a SWEET card, and I'm in awe of your zig watercoloring. I've tried it with flowers, before, but your gingerbread house and card are outstanding! Love this card, such a happy & warm card! thank you for sharing and giving me some great ideas. So cute!! Love the little details on this gingerbread set!! Your card is just darling! Love the coloring and love those sweet faces. I love this card and the stamp set. Beautiful colouring!! What a fun Christmas card! I love gingerbread cookies and houses... and stamping them would be much easier than making them in the kitchen! Thank you for sharing this fun card. It really does make me want to get out my Christmas stamps (although, I think I will need more after this hop!). How cute this gingerbread characters is!!! Adorable card! My favorite it "Christmas Home". Its a wonderful set and very versatile!! Great coloring. Such a cute card. Super adorable card! 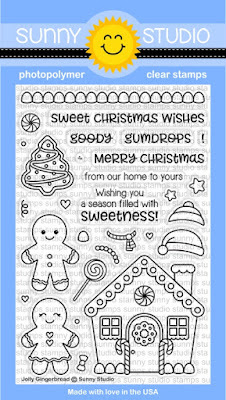 I love this new gingerbread stamp set. Thanks for sharing your artistic talents! Love your coloring. So cute! What a "sweet" card (pun intended)! Your coloring is just lovely! Wow!! Such a cute card!! Love the adorable scene you have created! Jolly Gingerbread is so cute! Your card is amazing and highlights the set so well! Such a sweet card. I love the gingerbread and everything is colored so beautifully. Oh my. Those gingerbread men are adorable! Thanks for the chance of winning. Oh my goodness!! This set is so amazingly cute and adorable!! I love gingerbread men and this card is so cute!! Love the way you have showcased the cutest stamps ever by Sunny Studios!! Have a great day!! You colored this so perfectly and the little gingerbread couple is the cutest ever. I love their hats! Love your colouring on this card. Thank you for sharing. What a great card! Really fabulous water coloring, wow! That is quite an adorable stamp set anddefinitely going on my wish list! They are just too cute! Love the coloring! Omg what a sweet card! Great job! I adore this stampset! Your card is just way too cute! Love that stamp set! This new release from Sunny Studio is filled with so many adorable things! Happy birthday Sunny Studio!! I'm gingerbread crazy and this is so adorable. Your coloring is gorgeous. Such a cute card, and I want everything in this release! Awww...your little ginger people are super sweet, and have such happy little faces. And I LOVE the cheery colors you selected for your scene. Thanks so much and have a blessed weekend. Hugs!!! Your card is really cute. I think my favorite set is the llamas. I love your cute card! That is the stamp set I'm going to use to make my granddaughters Christmas card this year! Love you cat's antics - he just had to put his touch on the card to give you a hand in making it! Thanks for the inspiration! You've used the stamp set that is actually top of the list as my favorite from this release. You've done such a fantastic job and had some tips as well. Super cute card! Thanks for the video! Great coloring! Absolutely adorable! This set is super cute, love your sweet card! Thanks for the inspiration! Lovely card ! But it's probably last year's creation because Sunny Studio is now 3 !!! Your gingerbread people are just adorable. Love your adorable Gingerbread House and sweet kiddies. Gingerbread house & people are so holidayish, and you've done a great job jusing that set.